Los Angeles based avant-garde collective Smegma have been around since the early 70's, so when they do avant-garde, it's not with the brash naiveté of high school students making noise in their garage. 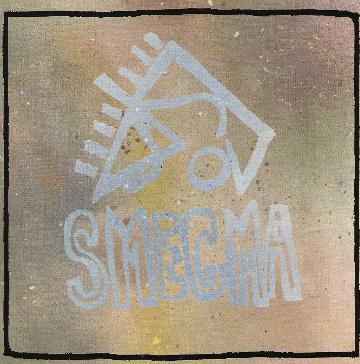 Smegma knows how to do avant-garde. Their latest studio effort, Rumblings, is full of scattered, off-kilter rhythms, squawking horns, psychedelic rock guitars, sound collage, random noises, quirky electronics, and wacky monologues, but it all comes together in a fascinating and often ironic journey into a sonic twilight zone. While some of the album tends towards a sound collage/random noise kind of thing, many of the tracks are quite distinctive, rising out of the chaos. With twittering wind instruments, bizarre off-key strings and grumbling, murmuring, scraping noises, In An Ornamental Garden sounds like a Japanese Zen garden gone horribly wrong. Electron is ambient music from a nightmare out of which emerge vague rhythmic structures and solos for broken televisions. Bunstuffer features a monologue about various unusual sandwiches and burgers available across the US set to deep scrapes and rumbles of sound. There are even a few near rock songs, like Worms, with a vocal rant set to raunchy psychedelic guitar and strange off-skew rhythms. Moonlegs is a groovy 60's style jam infused with radio and television transmissions, and the title track is some kind of mutant heavy blues freak out. While the album is often about "noises", it's not about noise, at least not in the sense of the modern post rock noise artists. As weird as the album gets, there's nothing here to damage the eardrums. In that sense, Rumblings is experimental music for hippies, young and old alike. For more information visit the Hanson Records web site at: http://www.hansonrecords.net. Or write to Hanson Records, P.O. Box 7496, Ann Arbor, MI. 48107 USA.